Much along the lines of Grant Morrison’s New X-Men, the first 12 issues of Astonishing X-Men and Rick Remender’s Uncanny X-Force, All-New X-Men is a surprisingly excellent X-comic. The initial premise read during solicitations struck me as unoriginal and yet from the very first issue, the creative team makes it work. With such a premise, unlike Superior Spider-Man (which I do enjoy), I find I’m not anticipating a return to the status quo. I’m not fretting over how or when the Original X-Men will return to their time. I’m enjoying the ride. I’m hooked into the new relationships. I find myself siding with the Original X-Men and their outlook of the future they’ve been cast into (Bobby makes me laugh almost every scene he’s in), and I love the way the older, more experienced X characters are just about forced into secondary roles. You don’t mess with the Original Fab Five. Immonen’s artwork is a great example of how to play with page layout within a mainstream book to allow the story to be told on multiple levels. His facial expressions, body language, panel design, costume elements – even handling this many characters in one book – is the level in which I wish most mainstream artists worked towards. Especially considering this title is often double-shipped. I’m not saying it’s the best! mainstream comic art! evah! It’s not even necessarily the best mainstream comic art today – but it is energetic, interesting and creative. And while the David Marquez issues may not always reach the bar Immonen is setting (and really, I can’t say I’m expecting him to. Immonen is a beast on this book. ), they are still in line more or less with the overall feel and that helps to keep the title consistent. I will say this – Marquez’s Original X-Men actually look like teens. He excels in making their physicality youthful. This 4×4 covers the first 12 issues even though I’ve read beyond issue 12 (I’m about ready to start the Battle of the Atom crossover). I may have to do a second grid at a future date. 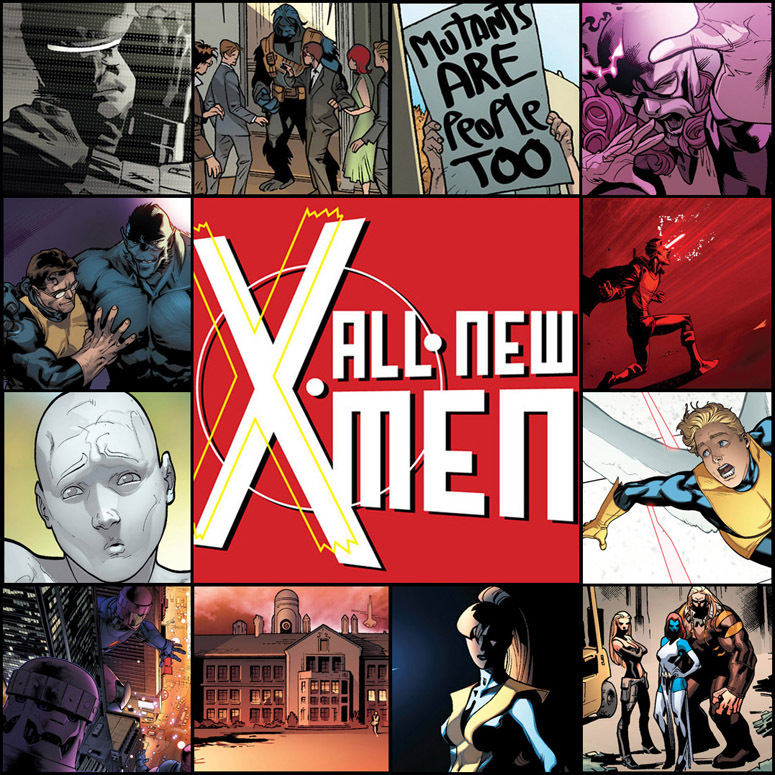 So bravo to the All-New X-Men creative team for one of my top Marvel Now reads.